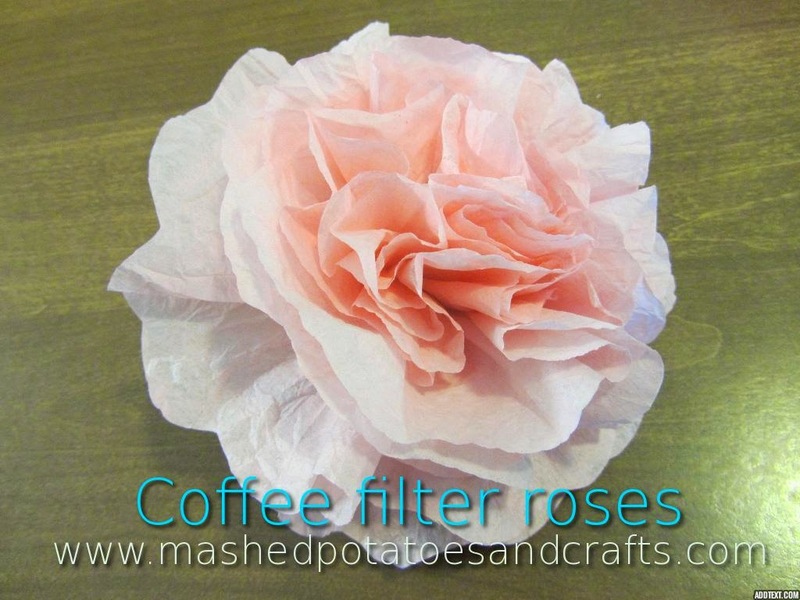 Today I have step-by-step detailed instructions on how to create beautiful coffee filter roses. 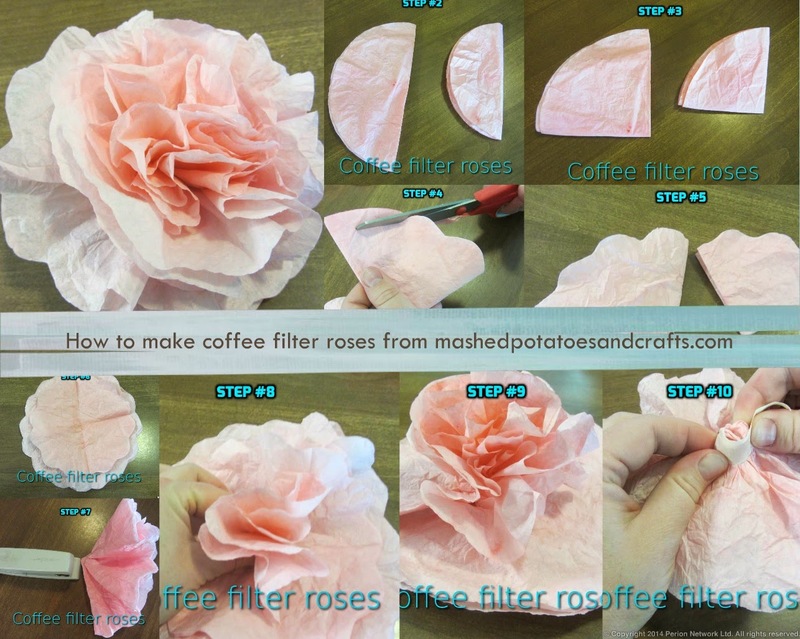 Here's a great collage you can pin and be sure to view my companion post on dying the filters! in half and in half again to form a triangular wedge. 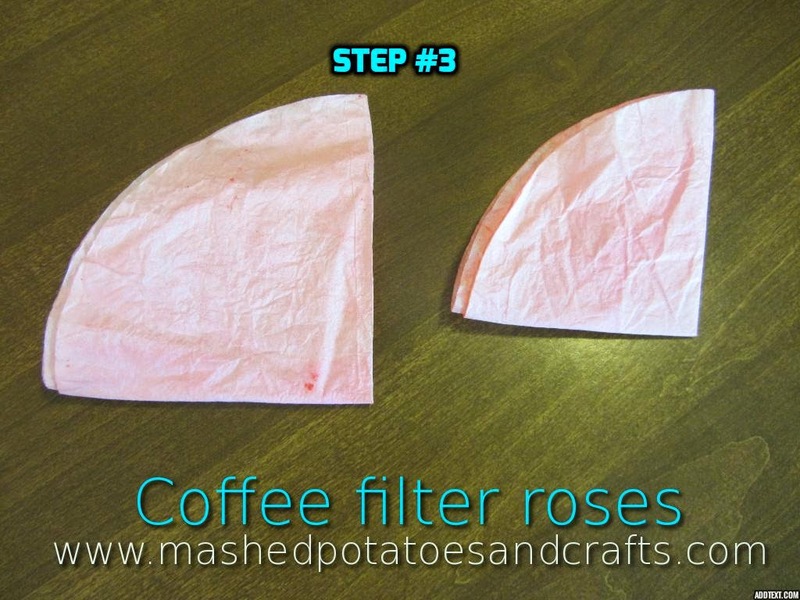 Using scissors, cut along the open end of the triangle to create a scalloped line. 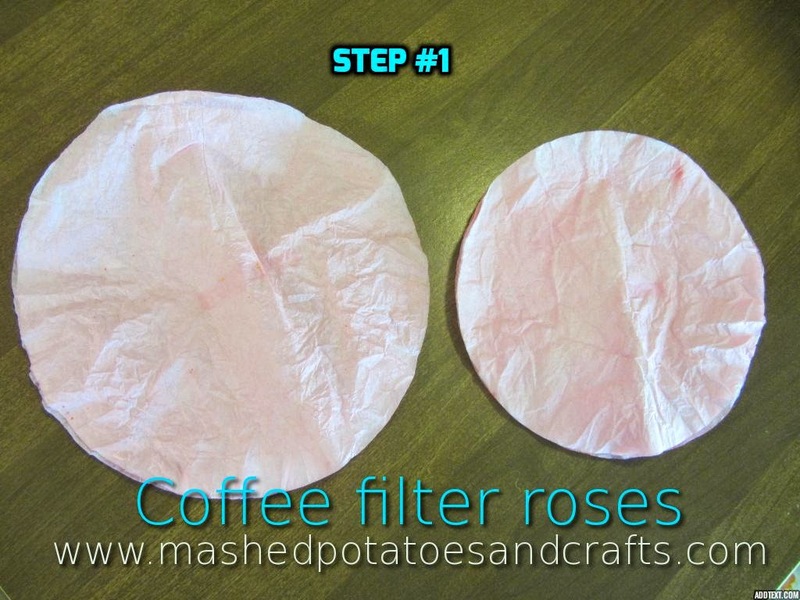 Do the same with the three small filters. 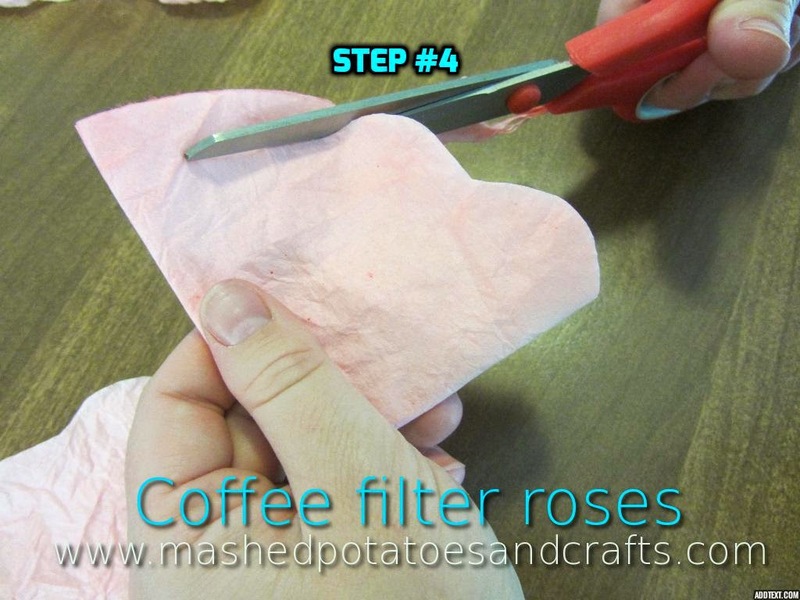 Open the cut filters and place the small stack on top of the large stack. 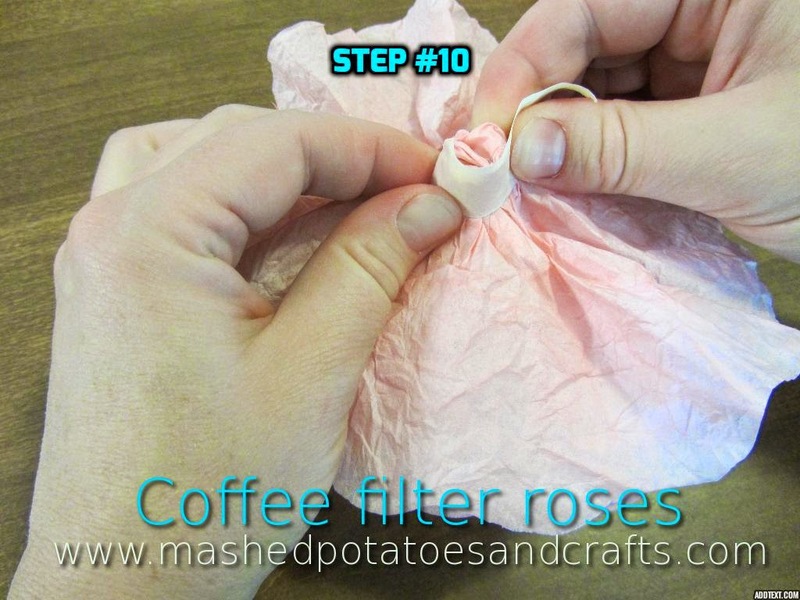 With your fingers, pinch the underside of the stack in the center, where the folds meet, which will cause the filters to crinkle together. 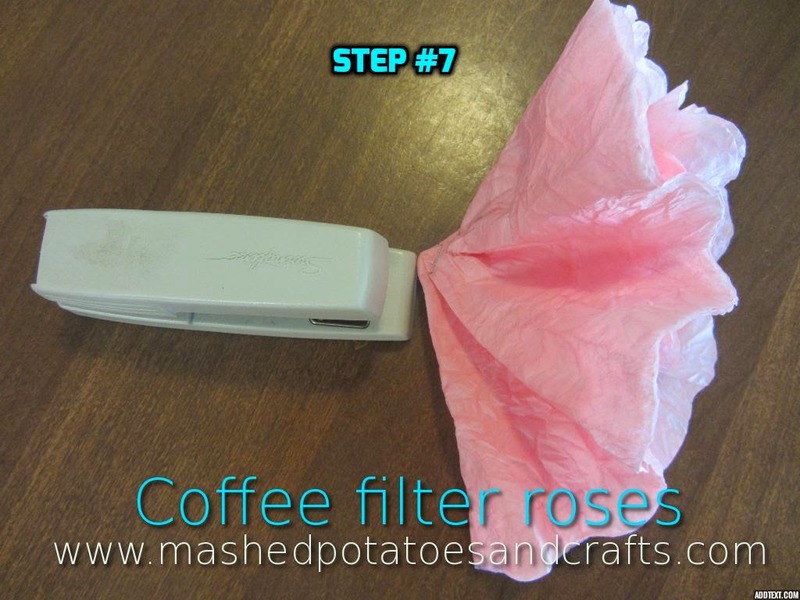 Using a stapler, staple just above where your fingers have pulled the filters together. 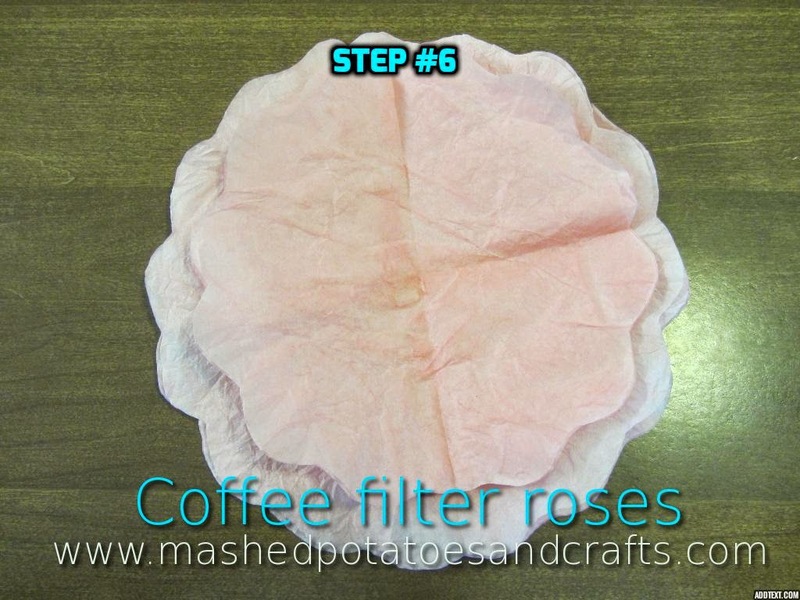 Turn the flower over and open up the filters. 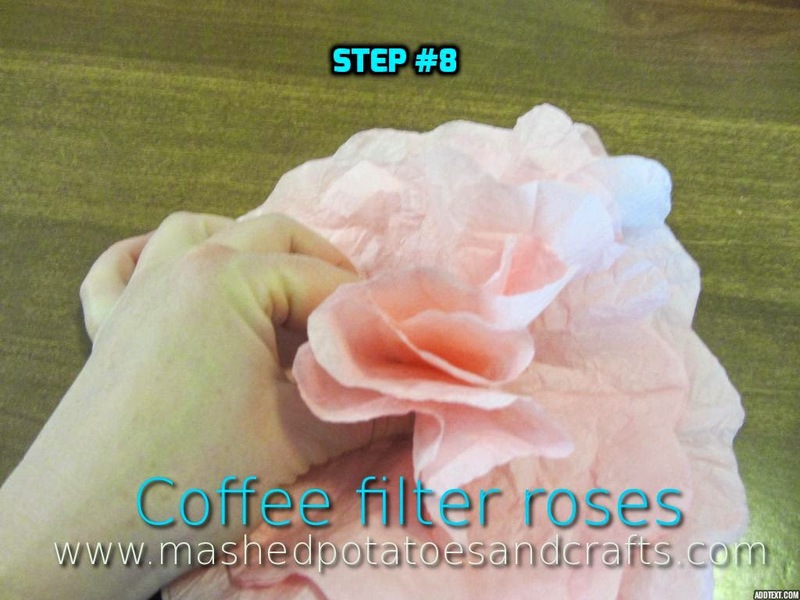 Beginning with the outermost filter, gather the filter at the base and pinch around the base to pull the circle tighter, forming ruffles and petal-like fullness. 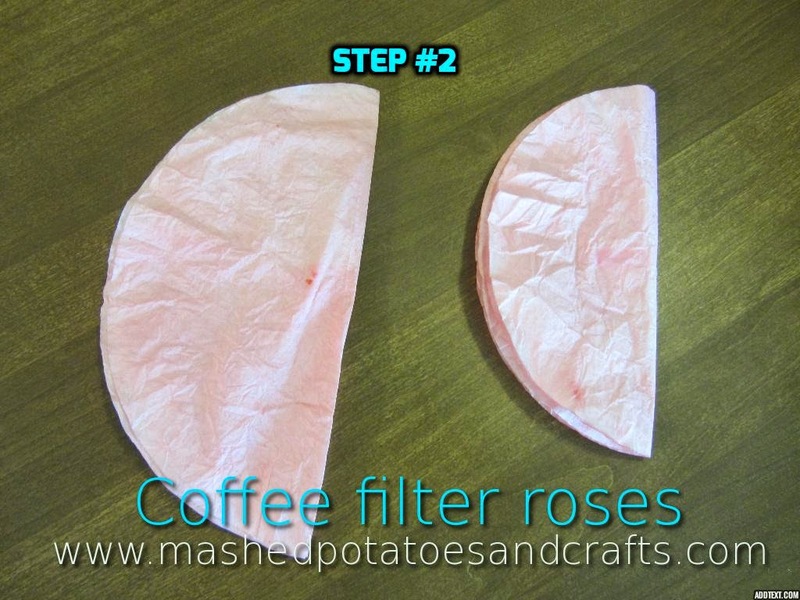 Repeat with each of the six filters, gathering them at the base and pinching along the bottom to create a stem-like bump on the bottom. Wind masking tape around the base to hold the shape. Use coffee filter roses as table décor, hang from the backdrops or ceiling, or use them to create floral wreaths. 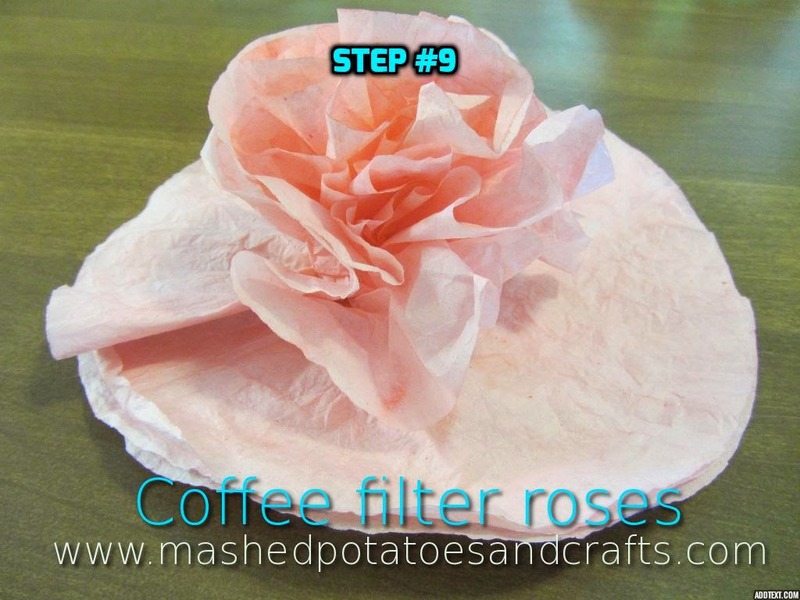 Then combine the first six ingredients and when your two year-old says, "Mom! Gook!" put him on the counter and let him cook for goodness sakes. Combine the sauce and noodles. Chop the vegetables and add to the noodles. Stir together and chill before serving. And there you have the best-tasting pasta salad with help from your garden peppers and tomatoes. Enjoy! I like to serve it with parmesan bread. Place sliced and buttered bread on a cookie sheet. Sprinkle with parmesan cheese and place under the broiler until very lightly toasted. I ran out of parmesan cheese the day I made this salad so there are no pics of parmesan bread. Use your imagination, or better yet, make some yourself for dinner tonight with this salad. Combine first six ingredients. Stir in remaining ingredients. Cover, chill. 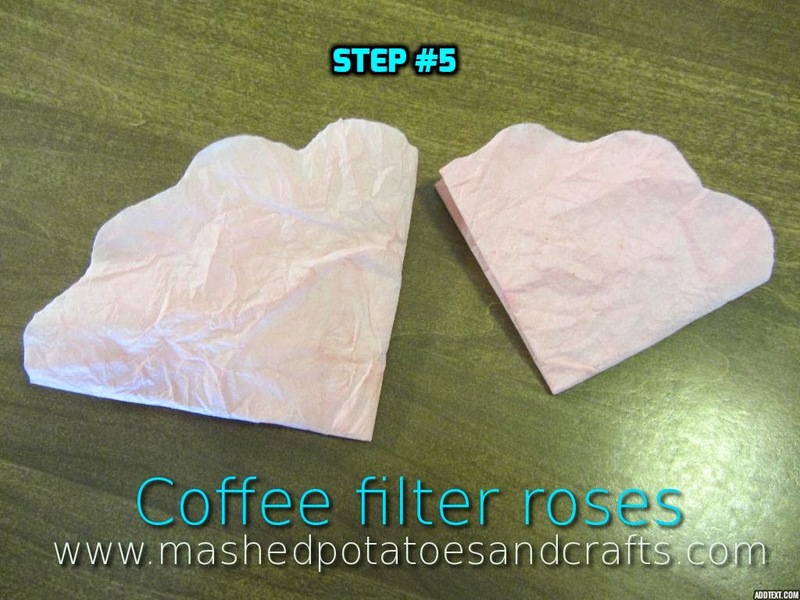 Makes 3 cups.